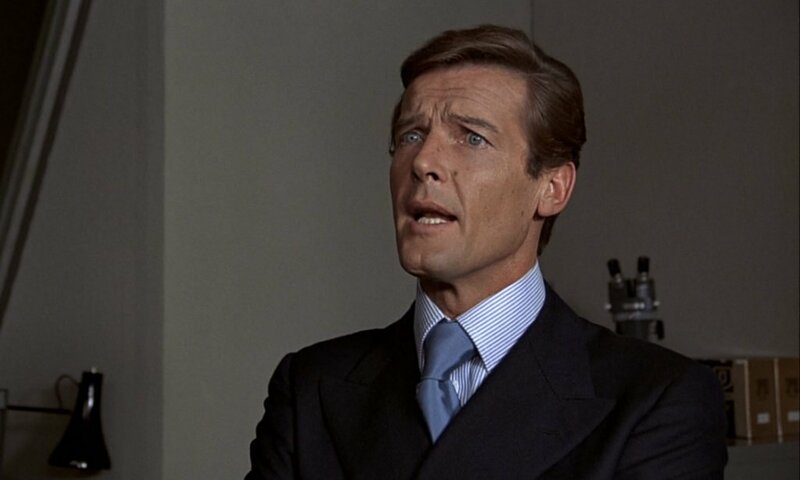 If you haven’t heard the good news already, the 23rd Bond film now has a confirmed release date of 9 November 2012! 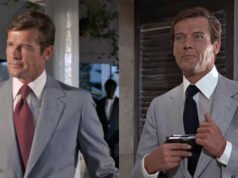 Back on topic, we previously looked at George Lazenby’s double-breasted blazer, and Roger Moore’s Cyril Castle navy blazer is very similar. Like the blazer before this one it has six buttons with three to button, in the naval tradition. The buttons are also silver-toned metal, the pockets are slanted with flaps, and there are double vents at the back. Moore’s blazer does not have a ticket pocket and the wrap is narrower. Moore’s blazer has his typical link-button cuffs. The overall style is mildly structured with a full chest and narrow shoulders with less padding than the typical military style. 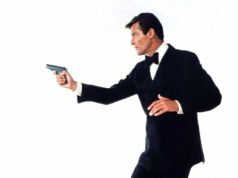 This navy hopsack blazer is worn on two occasions in The Man with the Golden Gun. On the first occasion he wears a blue and white fine bengal stripe shirt made by Frank Foster, slate blue satin tie and dark grey trousers. The second time he wears the blazer with a soft white shirt also made by Frank Foster, regimental tie with a white ground and navy stripes, and white trousers. The former combination is easier to pull off whilst the latter takes advantage of the blazer’s naval heritage. 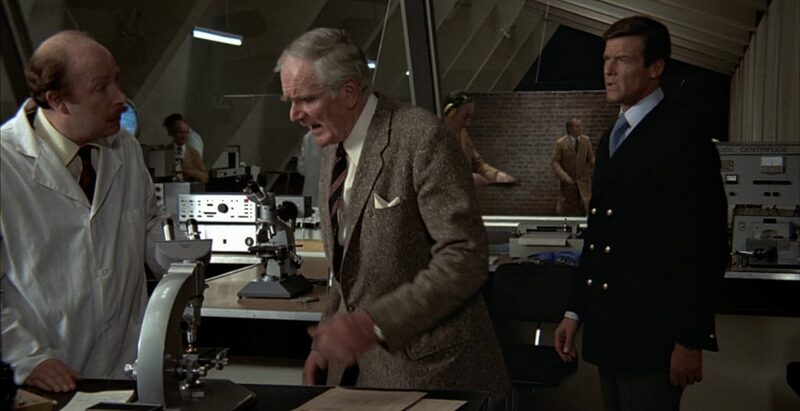 Quite appropriately, Bond wears the later combination on the wreck-turned-naval base RMS Queen Elizabeth. See a comparison of this blazer with George Lazenby’s very similar blazer in On Her Majesty’s Secret Service. This blazer does look special and different from other pieces Bond usually wear. Looks kinda like a military coat. But it suits his figure very well! 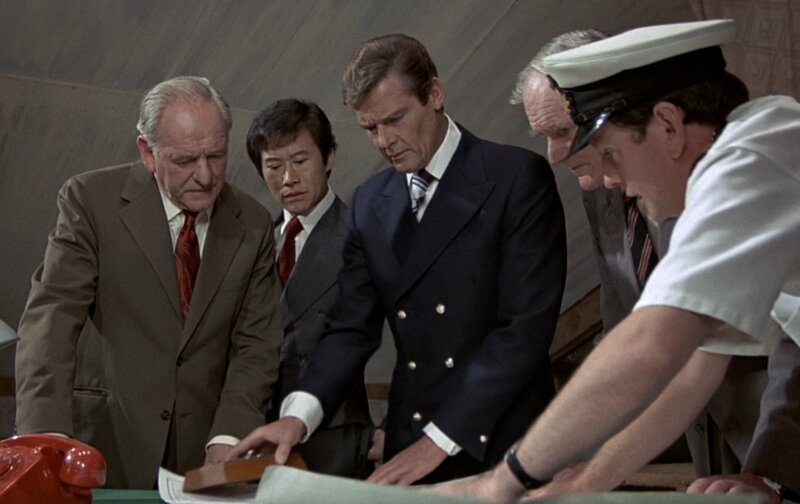 I absolutely love Roger Moore's 3-on-6 blazer; does anyone know if blazers like it are commercially available?